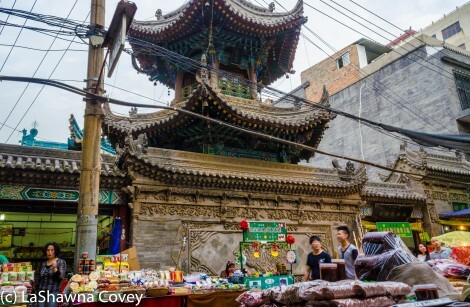 The third item on my Xi’an must do list was visiting the Muslim Quarter. 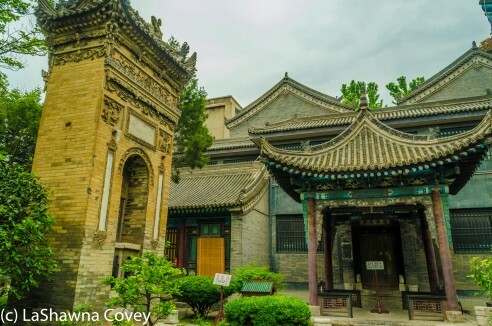 Muslims have a very long history in Xi’an, over 1,200 years, and the Great Mosque (Da Qingzhensi) was founded in Xi’an during the Tang Dynasty in C.E. 742. The mosque is tucked away deep inside the Muslim Quarter, at the confluence of narrow and busy shopping streets. 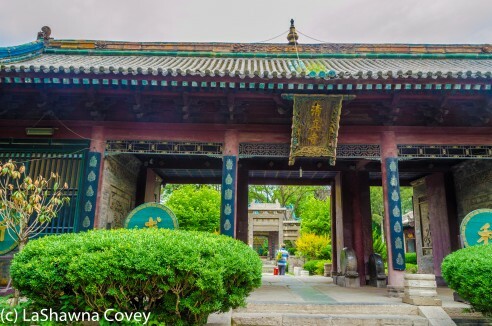 To get to the mosque involves a walk through one of the busiest, most colorful and vibrant parts of Xi’an. The Muslim Quarter is the best place for souvenir shopping in my opinion. There are a wide variety of shops around the city, but most of the stores are either geared specifically toward to the local buying market or more Western stores. But the Muslim Quarter is packed with stores selling local crafts, trinkets, art, jewelry, knockoff clothing, and pretty much anything you could want to buy as a tourist. There are a couple ways to arrive at the Great Mosque. 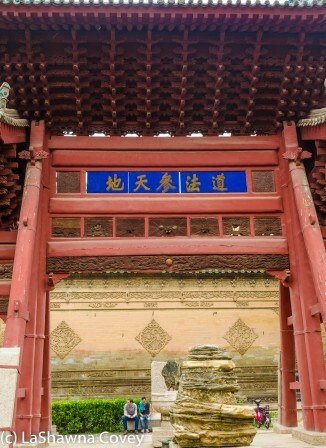 The main entrance to the Muslim Quarter is directly behind Drum Tower. 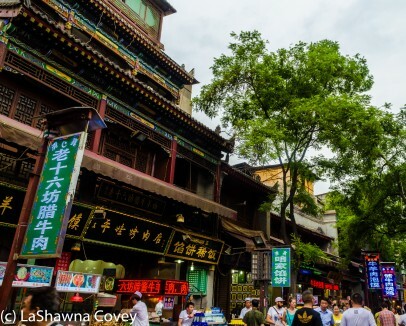 One way is to travel down the narrow covered alleyway filled with vendors on the first left. Another possibility is to travel straight down the main street of the quarter for a few hundred meters, and take a left and then another left down the other end of the covered alleyway (follow the signs). Eventually you will find yourself at the mosque. 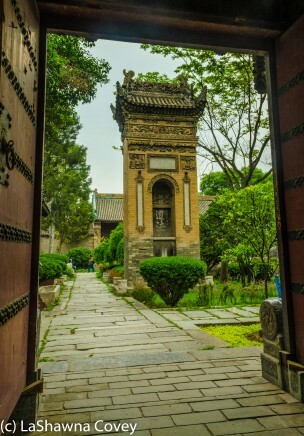 Da Qingzhensi is a peaceful complex in the densely populated neighborhood. 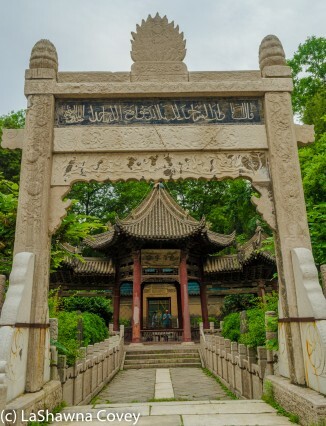 The mosque complex is filled with buildings built in an aesthetically pleasing blend of Arabic and Chinese architectural styles. 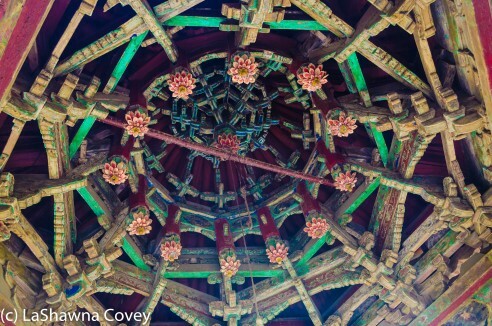 The prayer hall is towards the back of the complex, and it has a blue tiled roof. 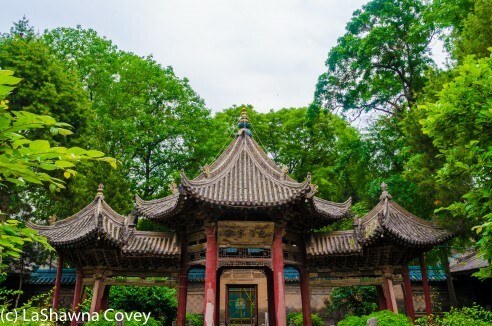 The mosque has its version of minaret which is closer to a Chinese temple pagoda. After visiting the mosque, it is very easy to just wander around the rest of the streets of the quarter. 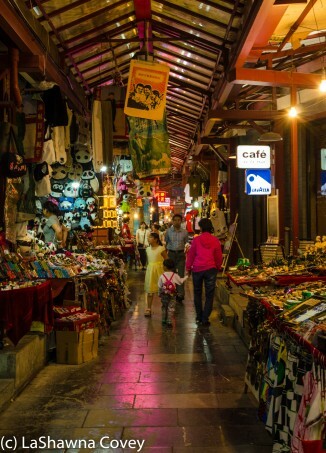 The Muslim Quarter is brightly lit with neon lights at all hours, but it particularly comes alive at night. 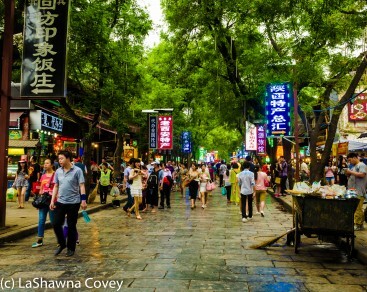 It is also one of the best places in Xi’an to indulge in a wide variety of street food. You could literally eat your entire day away in the quarter. 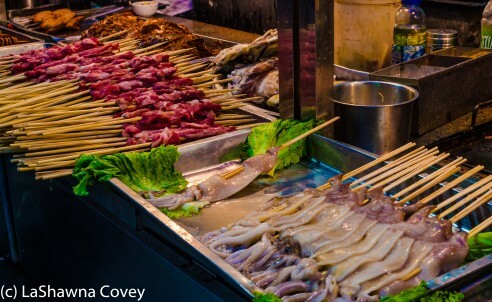 There are so many different meats and seafood on a stick to choose from. There are sweets and beverages of all kind. I even planned on eating at a restaurant, one that came highly recommended for excellent Muslim food, Jiasan Guantang Baozi. Likely the food is excellent, however, it certainly was not what I was expecting. I was expecting Middle Eastern Muslim food, which I love very much. Chinese Muslim food is radically different, offering up all sorts of dishes from all sorts of meat parts I don’t typically see on restaurant menus. While the food is probably delicious, since it certainly wasn’t what I wanted, this restaurant was one of the few restaurants I actually walked out of without ordering. Instead of strange meat dishes, I indulged in a very tasty local specialty. 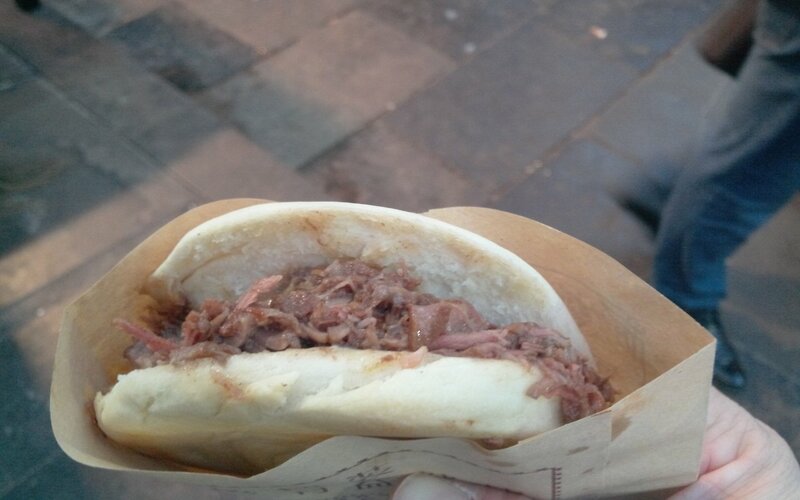 It’s called rou jia mo, and it is finely chopped pork pressed between two halves of a solid steamed bun. I capped that off with some local delicacy. 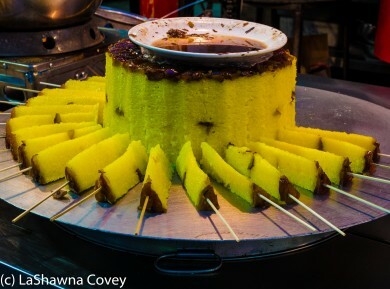 I don’t know what the name for it is, but it is some very sweet, dense cake dipped in honey. I had never seen anything like that before, and assumed it was pineapple until closer inspection. As I mentioned before, definitely don’t miss the Muslim Quarter. It is very much worth your time. 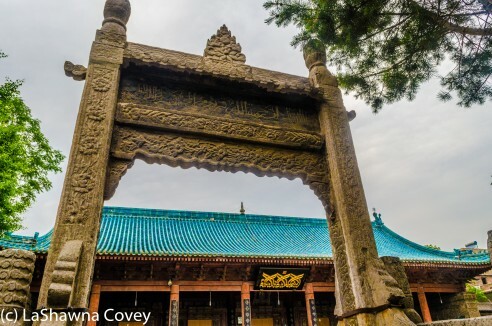 This entry was posted in Food, Photography, Travel and tagged China, Da Qingzhensi, Great Mosque, Muslim Quarter, rou jia mo, street food, Xi'An.